While I was living on the Prospect Heights/Crown Heights border, I watched as the development company Hello Living plopped down one development after the other in the area. All of the developments have a pretty distinct look — glassy and boxy. A few years ago, Hello Living started moving toward developing in Eastern Crown Heights. And now they’ve made it to Bed Stuy. 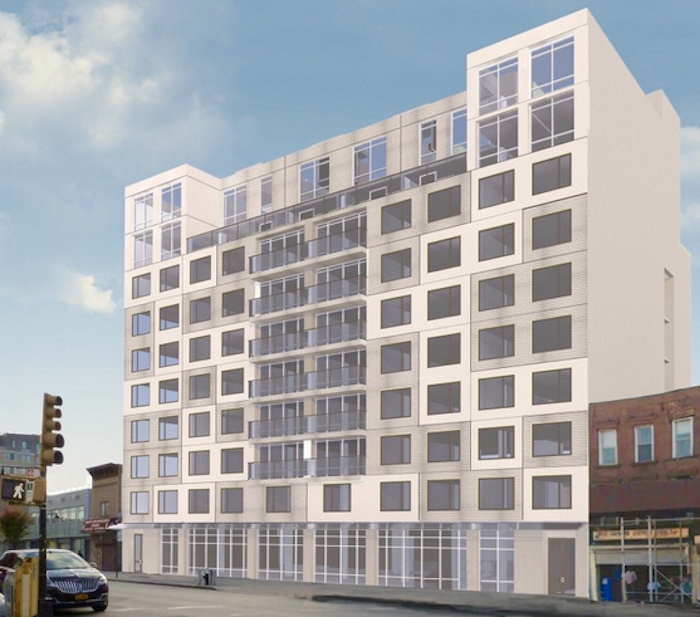 This 10-story, 50-unit rental development (to be called “Hello Fulton”) is coming to the former gas station at 1520 Fulton Street, right off the Kingston/Throop station. The Real Deal reports that the “nearly 56,000-square-foot building will feature mostly two-bedroom units with private elevators that open directly into the apartments. The apartments will flow from the front to the back of the building and have large terraces in the back.” There will also be ground-floor retail space. No word on the construction timetable, or pricing for the rental units. Hello Living paid $7.3 million for the site this March.